A HOSPITAL IN Dublin in the 1940s wrote to the Pro Cathedral as they were finding it difficult to foster children. This letter from a Catholic priest in the Pro Cathedral in Dublin to the Registrar of the Hospital of St Margaret of Cortuna discusses the issue of unmarried mothers and their children. 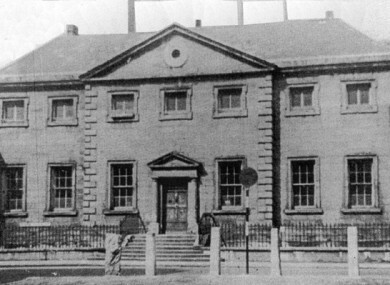 The Hospital of St Margaret of Cortona was situated on Townsend Street and was also known as the Westmoreland Lock Hospital for Incurables or ‘The Lock’. It was one of a few hospitals that catered for those suffering from ‘venereal disease’ or sexually transmitted diseases. I try and help a decent class of girl, a ‘first offender’, whose fall was mainly to ignorance or weakness. By decent class of girl, I mean one of a good family whom it will be possible to rehabilitate in her former position in life. He states that he tells the foster mother that the children of the women are perfectly healthy. The priest states that he also has the “Wassermann test” carried out on the mother “before taking the baby”. The Wassermann test is a test for syphilis and is rarely used today as it often produced false positive results. He said that he found that foster mothers always wanted reassurances from him that the mothers came from good family backgrounds and that the child was healthy. He said they often want a brief outline of the mother’s history. The father goes on to say that he does not arrange all adoptions in the hospital and that “in a great many cases”, it is in desirable that a mother and child be kept together. If her circumstances at home would make it difficult or impossible for her to take the baby home it would often be better to have both sent to an institution. He goes on to say that another solution would be for a family member to step in and help. He states that he does all this work “alone” and has to manage all the details by himself in addition to his parochial work. “In this letter I can only touch on the fringe of the difficulties inherent in the problem of dealing with unmarried mothers and her child,” he concludes. Email “This 1940s letter describes the 'decent class' of unmarried mothers who were 'first offenders'”. 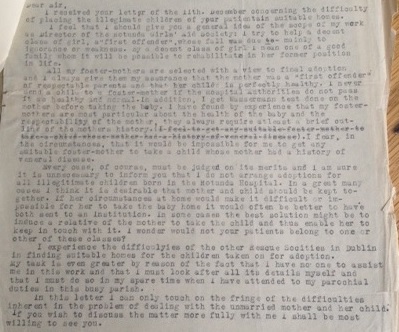 Feedback on “This 1940s letter describes the 'decent class' of unmarried mothers who were 'first offenders'”.